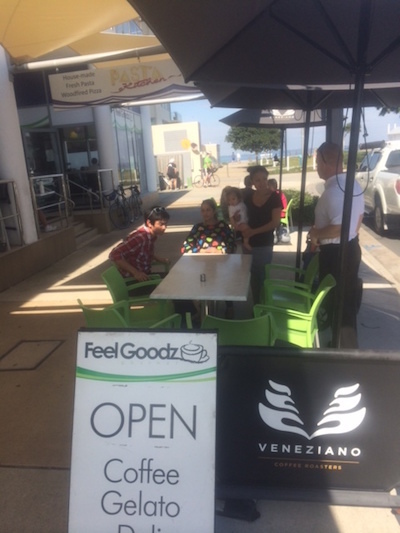 Feel Goodz Gourmet, located next to scenic Woody Point Jetty, is the ideal place to dine with family and friends. The Delicatessen and Espresso Bar is home to a fantastic selection of imported and local gourmet and artisan food products and is renowned for their delicious house made gelato and sorbet. Feel Goodz Gourmet also serves Breakfast and Lunch daily. Patrons can choose from classic Breakfast favourites such as hand cut fruit salad served with natural yogurt and honey; Eggs Benedict with your choice of bacon, smoked salmon or mushrooms and baby spinach; and the always satisfying B.T. Sandwich with layers of grilled bacon rashers and rich balsamic tomatoes on toasted Turkish bread. Lunch is also another tantalising affair generous deli platters, filled to the brim with smallgood meats, Australian cheeses, marinated olives, Tasmanian salmon, salad greens, grilled vegetables, crackers and dips; the Fillet Steak Sandwich with aioli, onion marmalade, Swiss cheese, salad greens and grilled potatoes; and a range of hearty salads. A popular selection of wood fired pizza and gourmet pastas are offered on Friday and Saturday evenings in the Pasta Kitchen. Patrons can indulge in their chosen meal in the spacious dining room or opt for the outdoor seating. If the sun is out, why not relax outside and enjoy the spectacular views of Bramble Bay and Mount Glorious! In addition running regular interactive cooking classes and offering specialised picnic and accommodation hampers, Feel Goodz Gourmet also has a large selection of gift ideas! For more information on the menu, location and latest offers and deals, please visit the Feel Goodz Gourmet website and 'like' the Facebook profile.